Once home to countless heart-shaped hot tubs and champagne glass whirlpool baths, the Poconos had a bit of a sordid, poor man's Niagara Falls "romantic" reputation. Today, however, this mountainous section of Pennsylvania is better known as a high-value, four-season, family-friendly destination with a wealth of natural and recreational opportunities. 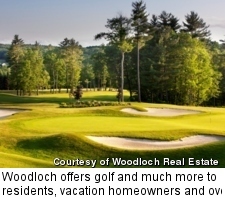 The Woodloch resort epitomizes this, offering golf and much more to residents, vacation homeowners and overnight resort guests. For kids, the resort has a bit of a carnival atmosphere, with activities more often found at state fairs than golf resorts, including bumper cars, batting cages, paintball, go-karts, miniature golf, zip lines and much more. For adults, the range of things to do is equally broad, with trap shooting, a full-service marina on a large lake, tennis, fitness classes and a large gym. Other activities include horse-drawn sleigh rides and water skiing. In winter there is snowmobiling, tubing and sledding. There are also a half dozen alpine ski resorts nearby. Woodloch was already a 30-year-old resort when the residential component arrived along with the golf course in the early '90s. 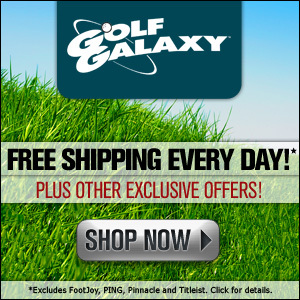 The course quickly became a major attraction for both resort guests and owners. 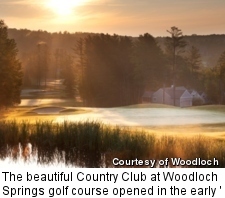 The Country Club at Woodloch Springs has been rated four-and-a-half stars by Golf Digest and was named among the top 10 new courses in the nation by Golf Magazine when it opened in 1992. The fairways on this traditional parkland design are isolated from each other by thick stands of tall trees, with rolling mountainous terrain and natural wetlands. The signature hole is the par-5 14th, which demands a 220-yard carry over Hells Gate Gorge (full of rushing water 200 feet below) off the tee. In addition to the course there's a 16-acre, state-of-the-art teaching facility. And like the rest of Woodloch, it has a family focus, led by John Pillar, the director of golf who has been recognized as one of the top 50 kids teachers in America by US Kids Golf. One of the biggest appeals of the Poconos region is its location in central Pennsylvania and its proximity to a huge swath of the U.S. population, while still maintaining its frozen-in-time rural character. It is just two hours from New York City, three from Philadelphia or Syracuse, N.Y., and approximately five from Baltimore and Washington, D.C.
Low real estate prices don't hurt, either. 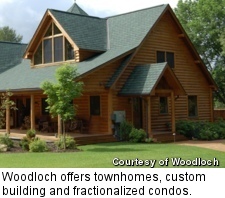 Woodloch has a variety of real estate offerings, including townhomes, custom building and fractionalized condos. These are spread between two communities, Woodloch Springs (where the golf course is located) and the Reserve at Woodloch. The latter is new and focused on a natural wooded setting full of hiking trails. This development is only for custom homes, with just 21 parcels averaging about one full acre on 44 acres. Lots start at just $100,000, and the most expensive for sale (more than 1.15 acres on a private cul de sac) is $184,000. 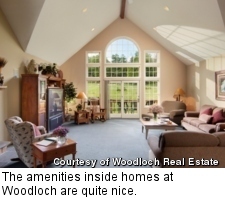 Most of the real estate is in Woodloch Springs, which is more than 20 years old and well established (more than 90 percent of the lots have been built on). It has 402 pieces of property on 438 acres, including the golf course. Low-maintenance townhomes start at $235,000 for two bedrooms, two baths with a garage and deck. The more typical units feature three bedrooms and two baths with a whirlpool tub in the master bath and a large deck for $260,000. Large single-family, detached homes start at $335,000, which include a finished basement, wet bar, family room and expansive decks. 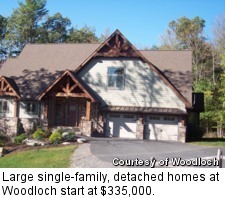 Even the most expensive property for sale at Woodloch is a relative bargain at $1.2 million. It is a true compound on nearly 12 acres, with private gates and a 600-foot driveway. The 6,400-square-foot home has seven bedrooms (five with private balconies), six full and two half baths, decks, patios, screened porches, fireplaces, a home theater, hot tub and much more. At the low end of the price spectrum are the "Four Season Country Homes." They are essentially townhomes sold as fractional intervals with either one or two weeks per season (for a total of four or eight weeks annually) from $40,000 and $65,000, respectively. Undeveloped lots for custom building range from just less than $90,000 to just more than $450,000. At these prices and with these amenities, the appeals of Woodloch become obvious, attracting both full-time residents as well as those looking for a weekend or summer escape.